Poet Barbara de la Cuesta: I recently rode the Red Line in Boston from end to end, and there was nothing interesting to read overhead. 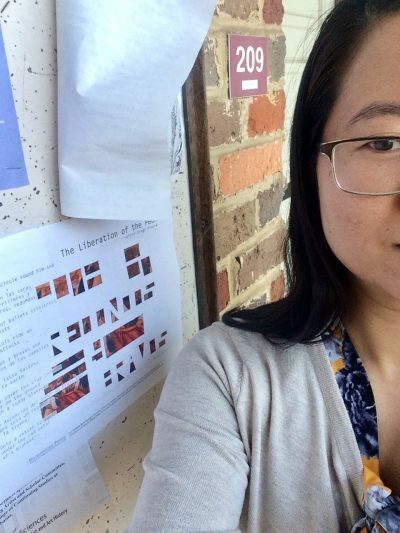 Artist Millian Giang Pham: The experience of reading this poem is very meta in the best sense; there are so many layers of experience, translation, and reinterpretation. I’m drawn to the fact that it’s an articulation of a particular experience of viewing Diego Rivera’s painting, which is itself a reinterpretation and representation of a historical event, and that the poem has multiple languages. 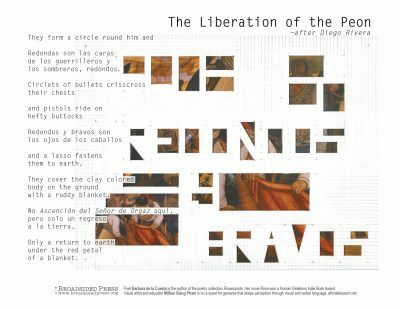 Artist Millian Giang Pham: I would love to see this broadside get framed and presented next to Rivera’s painting at the Philadelphia Museum of Art. Poet Barbara de la Cuesta: I hoped the artist would refer back to the Rivera painting, which is what happened. I love the different glimpses into parts of the painting that reflect images in the poem. The artist shows great sensitivity in the response. Artist Millian Giang Pham: It was the idea of reading an image that got me started with combining words with images. I compared how the poem articulates components of the painting while I viewed the high-resolution image of it through the Philadelphia Museum of Art website. In emphasizing certain qualities of the artwork, other components of it become hidden. This duality of emphasis and de-emphasis became the basis for how I composed the piece. Have you ever written work that has been inspired by visual art (other than Diego Rivera’s!)? What was that experience like for you? Why were you inspired to do so? Poet Barbara de la Cuesta: I wrote one other poem about the still life artist J.F. Peto, whose home is now a museum. Long ago it was a bed and breakfast run by his granddaughter and maintained as it was when he was alive, I rented a room there for a year and fell under the spell of his surroundings as depicted in his still lives. This is in Island Heights, NJ., near where I live now. Artist Millian Giang Pham: I’m interested in the way we use language to express ideas and thoughts. As a visual artist, the visual language contains larger gray zones than verbal language, which allows for broader meaning but also more misinterpretation and misunderstanding. It is such an imperfect and wicked system that to get anywhere, I would have to embrace the whole of it. Sometimes I prefer the pairing of art with literature as a way to focus attention. Poet Barbara de la Cuesta: Very hot and still with a storm coming. Artist Millian Giang Pham: A salt storm over arid terrain. Poet Barbara de la Cuesta: I lived many years in South America and try to read in Spanish. I’m reading a collection of Garcia Marquez’s journalism El Escándalo del Siglo. Lincoln in the Bardo is another book I’ve read lately and really admire. Artist Millian Giang Pham: Starting a couple years ago, I’ve been trying to make social media work to my advantage. So I’ve curated my Facebook feed to send me articles from my favorite art magazines and creative art news source. Every day has been a wonderful mixture of career advice, art opportunities, and basically brain fodder to keep the creativity flowing. Needless to say, reading articles has made it more difficult to pick up a book because I’m always on and working all the time. This method of trying to become healthier in my career advancement is a process of give and take. It’s great to always learn new ways of organizing my life and trying out the next hack, but there’s also a point of diminishing return. I’ve started tuning out the noise to figure out what really works for me. All these listicles and hacks are methods that work for other folks; it’s their value systems and standards. Each one of us have to discover our own values and fine tune the method that works best for us individually. Poet Barbara de la Cuesta: My latest trip to Philadelphia was to revisit the Barnes Museum in Philadelphia. It has a wonderful collection of ancient and Impressionist art mixed and hung from floor to ceiling. For example, a Picasso next to an African mask. There’s a complete absence of Renaissance art. All natural light, in a newly designed space. Unique in every way. Artist Millian Giang Pham: I saw Julie Mehretu’s lithographs and etchings at our local university gallery (the Sarah Moody Gallery of Art at the University of Alabama). I’m fond of Mehretu’s drawings, so these translation of drawings via printmaking methods really shocked me. Most of the marks were lifeless and each composition appeared mechanical overall. Looking at these prints reaffirmed my love for the direct mark-making in the process of drawing, and reaffirmed the value of drawing as a process, a material, and an end in general. Poet Barbara de la Cuesta: That such a work as The Liberation of the Peon comes out of the same culture as The Ascención del Señor Orgaz says something to me about how rich the Spanish tradition is on two continents. Poet Barbara de la Cuesta has received fellowships from the Massachusetts Artists Foundation, and the New Jersey Council on the Arts, as well as residencies at the Ragdale Foundation, The Virginia Center, and the Millay Colony. Her poetry collection, Rosamundo, was published in 2017 by Finishing Line Press. Her novel, The Spanish Teacher, was winner of the Gival Press Novel Prize in 2007, and a more recent novel, Rosa was winner of the Driftless Novella Prize from BrainMill Press, in 2017. This novel has recently won gold in the Human Relations Indie Book Award. This month it was announced she had won the Bright Horse Press Prize for a collection of short stories, The Place Where Judas Lost his Boots. Note: “The Liberation of the Peon” appears, in an earlier form, in the chapbook On the River This Morning. 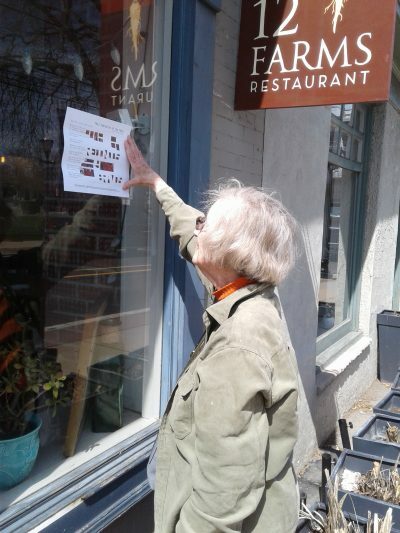 The poet Vectorizes outside an upscale restaurant in Princeton, NJ. The artist Vectorizes on a local notice board.